Board a morning flight to Srinagar. Once you arrive at the Srinagar airport, meet an IHPL representative who helps you in an assisted transfer to a Jetty on the Boulevard Road. After reaching the Jetty, get transferred to your pre-booked Houseboat. A welcome drink is served. Complete the check-in formalities. The rest of the day is free. Indulge in the activities of your interest such as shopping for souvenirs, relishing sumptuous local delicacies, exploring the surrounding area on your own and more. Overnight stay in the houseboat. Today post breakfast, get an assisted transfer to the very mesmerizing town of Gulmarg (50 kms) that is placed on an altitude of 2690 m above the sea level. After arriving, check into your pre-booked hotel. Afterwards, relish lunch. Now you are free to spend the day as per your liking. You can opt for either a pony ride or a Gondola Ride (cable car) from Gulmarg to Khilamarg. This two-staged ropeway is the second highest in the world. Admire the beautiful scenery while in the Gondola. After you finish the second stage, you can even go higher to visit popular sites like India-Pak LOC and Kabootar Valley. The other option is of visiting the Golf Course, if you wish to partake in the game. Return to the hotel for dinner and night halt. In the morning, on day 4, get transferred to Pahalgam (139 kms), after having breakfast. 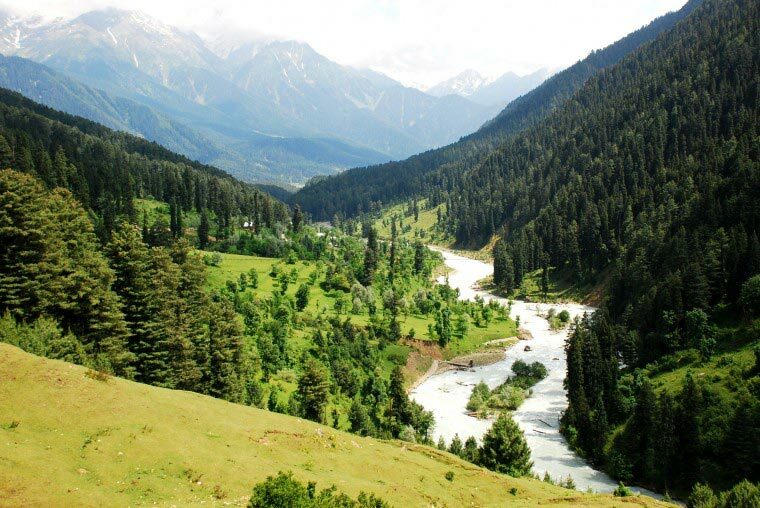 Pahalgam is one of the most popular tourist destinations, around 7200 feet above the sea level. Placed on the banks of river Lidder, it has been a favorite place for shooting of a number of Bollywood movies. It is also the entry point for Amarnath yatra, a popular spiritual journey for Hindus. En-route, you can halt at Avantipur Ruins (time permitting). The place has 2 temples, dedicated to Lord Vishnu. Around 1100 years old, these temples were erected by King Avantivarman. On arriving, check into the hotel. Spend the day in doing leisure activities. You can visit the local market or can also opt for a pony ride. Enjoy the lush scenery, sprinkled all around. Dinner and overnight stay in Pahalgam. After breakfast, the day is at leisure. 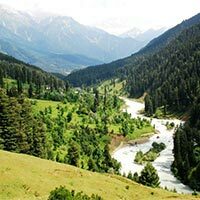 You may go for walks or pony ride to one of the many beautiful spots around Pahalgam (at your own cost). The list of attractions that must not be missed can include Chandiwari, Aru Valley and Betaab Valley. The initiating point of Amarnath Yatra, Chandanwari is an extremely scenic picnic spot where you can also partake in sledge riding. A popular picturesque destination, Betaab Valley is famed for being base camp site for trekking enthusiasts. Aru Valley is a gorgeous village, known for its peaceful surroundings, floral meadows and lakes. If you like partaking in adventure sports, you can also indulge in rafting in Lidder River. Dinner and overnight stay at hotel. Return to Srinagar (87.2 km), post breakfast. Once you reach there, first visit the Shankaracharya Hill Temple, also known as Jyesteshwara temple, which was built during the 9th century. You then visit the very well-known Mughal Gardens, a group of well-maintained gardens that are built in Persian style of architecture. Here you cover Nishat Bagh or the garden of pleasure- a Mughal terrace garden which is second largest in Kashmir, founded in 1633 AD by Empress Noor Jahan; Chashmi-e Shahi- built in 1632 around the royal spring by Ali Mardan, one of Emperor Shah Jahan’s governor and lastly, Shalimar Bagh, also called the abode of love, it was built in 1619 by Mughal Emperor Jahangir for his beloved wife Nur Jahan. After lunch, enjoy a Shikara ride on the placid waters of Dal Lake. Treat your eyes to the beautiful scenery, shop for knick-knacks from the floating market and so on. Spend the rest of the day in doing leisure activities. Return to your room in the evening for overnight stay. Post breakfast, day 7 is scheduled for day-trip to Sonamarg (80 km). The journey is filled with a lot of scenic beauty. On arrival in this beautiful town, which is located at an altitude of 2740 m above the sea level, you can opt for a pony ride to Thajiwas Glacier, around 7 km from Sonmarg. You can find snow here all around the year. Treat your eyes to the enchanting scenery, snow-covered mountains and waterfalls. Around 9186 feet above the sea level, this place offers you a number of captivating views. Back to the houseboat for dinner and night halt. Post breakfast on the last day of the tour, enjoy the beautiful surroundings till departure. Get transferred to the Srinagar airport to board a flight for departure to your onward destination.